Another "Good Time Offering" from Carter Cellars available only in Magnum format. A monumental wine, that possesses serious mineralogy as well as huge notes of tobacco leaf, springtime flowers, blueberries, blackberries, and licorice in both the aromatic and flavor profiles. The finish is endless in this super-intense, rich wine. Like all of our Beckstoffer To Kalons the sweetness of tannins and the emerging complexity permits enjoyment at this early stage, but let it age for 10 to 25 years to see the best of what this wine has to offer. Extremely limited, so act with haste. "The 2013 Cabernet Sauvignon Beckstoffer To Kalon The G.T.O., short of any meaningful description, is simply one of the most profound and extraordinary Cabernet Sauvignons I have ever tasted in Napa Valley, and that’s saying something, given the extravagant cascade of great, great wines that have appeared in 2012 and 2013. This has it all. It’s like taking Chateau Latour and reducing it to the essence of that site, combined with the incredible purity, crème de cassis and blackberry fruit of the To Kalon Vineyard. This wine transcends reality -- a mind-boggling effort that every wine lover deserves to taste once in their life. A true bucket list Cabernet Sauvignon, available only in magnum and obviously very limited, it’s a tour de force, a majestic achievement and a showcase for what Napa is increasingly doing. Drink it over the next 50 years.."
The Beckstoffer portion of the historic original To Kalon Vineyard in the Oakville AVA was purchased from Beaulieu Vineyard in 1993. 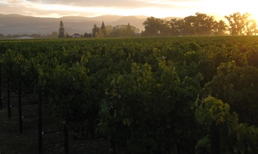 Beaulieu had purchased the property from the Crabb estate in 1940 and called it their Beaulieu Vineyard No. 4. Napa Pioneer Hamilton Crabb first planted the vineyard in 1868 and it has produced some of the Napa Valley's best red grapes ever since. Replanted after phylloxera by Beckstoffer from 1994 to 1997 to multiple clones of Cabernet Sauvignon and Cabernet Franc with modern trellising and closer vine spacing, the vineyard produces several luxury award winning vineyard designated wines. These vineyard designated Cabernet Sauvignon wines include Schrader Cellars, Paul Hobbs, Provenance, Realm and of course, Carter Cellars. 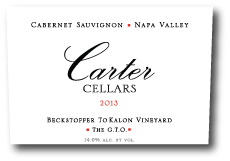 The Carter Cellars 2013 Beckstoffer To Kalon - 'The G.T.O.' 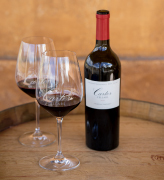 Cabernet has sold out, but other Carter wines are available.